Single Sign On (SSO) and related token exchange mechanisms are becoming the most common scenario for the authentication and authorization in different environments on the web, specially when moving into the cloud. This article talks about the integration of Keycloak with jBPM or Drools applications in order to use all the features provided on Keycloak. Keycloak is an integrated SSO and IDM for browser applications and RESTful web services. Lean more about it in the Keycloak's home page. It basically consists of securing both web client and remote service clients through the Keycloak SSO. So either web interface or remote service consumers ( whether a user or a service ) will authenticate into trough KC. Consists of securing the remote services provided by the execution server (as it does not provides web interface). Any remote service consumer ( whether a user or a service ) will authenticate trough KC. This section describes how a third party clients can consume the remote service endpoints provided by both Workbench and Execution Server. Keycloak is a standalone process that provides remote authentication, authorization and administration services that can be potentially consumed by one or more jBPM applications over the network. The resulting environment and the different configurations for this article are based on the jBPM (KIE) Workbench, but same ones can also be applied for the KIE Drools Workbench as well. Keycloak provides an extensive documentation and several articles about the installation on different environments. This section describes the minimal setup for being able to build the integrated environment for the example. Please refer to the Keycloak documentation if you need more information. Download latest version of Keycloak from the Downloads section. This example is based on Keycloak 1.9.0.Final. Security realms are used to restrict the access for the different application's resources. Once the Keycloak server is running next step is about creating a realm. This realm will provide the different users, roles, sessions, etc for the jBPM application/s. Keycloak provides several examples for the realm creation and management, from the official examples to different articles with more examples. You can create the realm manually or just import the given json files. Go to the Keycloak administration console and click on Add realm button. Give it the name demo. Note: As you can see in the above settings it's being considered the value kie-wb-6.4.0.Final for the application's context path. If your jbpm application will be deployed on a different context path, host or port, just use your concrete settings here. Go to the Users section and create the admin user. Set the password with value "password" in the credentials tab, unset the temporary switch. At this point a Keycloak server is running on the host, setup with a minimal configuration set. Let's move to the jBPM workbench setup. For this tutorial let's use a Wildfly as the application server for the jBPM workbench, as the jBPM installer does by default. Let's assume, after running the jBPM installer, the $JBPM_HOME as the root path for the Wildfly server where the application has been deployed. ./standalone.sh -c standalone-full.xml // Setup the KC client adapter. 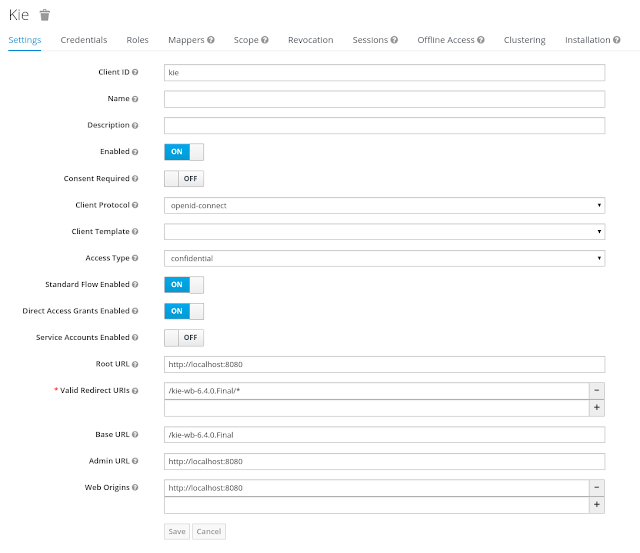 Once installed the KC adapter into Wildfly, next step is to configure the adapter in order to specify different settings such as the location for the authentication server, the realm to use and so on. In this example let's use the second option, use the Keycloak subsystem, so our WAR is free from this kind of settings. If you want to use the per WAR approach, please take a look here. Realm - Is the realm that the applications will use, in our example, the demo realm created on step 2. Resource - The name for the client created on step 2. In our example, use the value kie. Enable basic auth - For this example let's enable Basic authentication mechanism as well, so clients can use both Token (Baerer) and Basic approaches to perform the requests. Credential - Use the password value for the kie client. You can find it in the Keycloak admin console -> Clients -> kie -> Credentials tab -> Copy the value for the secret. For this example you have to take care about using your concrete values for secure-deployment name, realm-public-key and credential password. You can find detailed information about the KC adapter configurations here. Both jBPM and Drools workbenches provides different remote service endpoints that can be consumed by third party clients using the remote API. Important note: The user that consumes the remote services must be member of role rest-all. As on described on step 2, the admin user in this example it's already a member of the rest-all role. The KIE Execution Server provides a REST API than can be consumed for any third party clients,. This this section is about how to integration the KIE Execution Server with the Keycloak SSO in order to delegate the third party clients identity management to the SSO server. 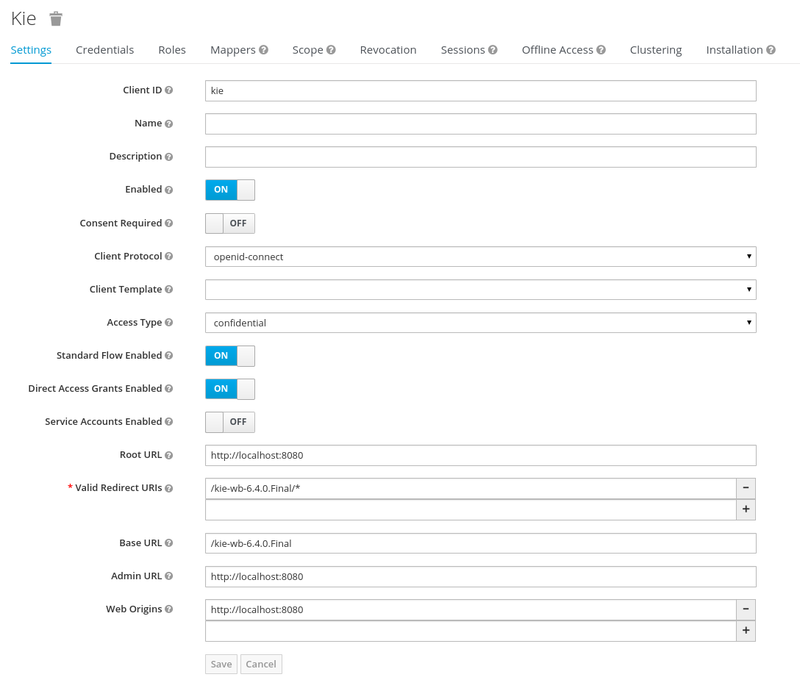 As per each execution server is going to be deployed, you have to create a new client on the demo realm in Keycloak. In this example the admin user already created on previous steps is the one used for the client requests. So ensure that the admin user is member of the role kie-server in order to use the execution server's remote services. If the role does not exist, create it. 1.- Install another Wildfly server to use for the execution server and the KC client adapter as well. You can follow above instructions for the Workbench or follow the official adapters documentation. Credential -> Use the secret key for the kie-execution-server client. You can find it in the Credentials tab of the KC admin console. Just deploy the execution server in Wildfly using any of the available mechanisms. Important note: The users that will consume the execution server remote service endpoints must have the role kie-server assigned. So create and assign this role in the KC admin console for the users that will consume the execution server remote services. In order to use the different remote services provided by the Workbench or by an Execution Server, your client must be authenticated on the KC server and have a valid token to perform the requests. Please ensure necessary roles are created and assigned to the users that will consume the remote services on the Keycloak admin console. If the KC client adapter configuration has the Basic authentication enabled, as proposed in this guide for both WB (step 3.2) and Execution Server, you can avoid the token grant/refresh calls and just call the services as the following examples.